In 2006 major car companies destroyed thousands of electric cars that they had created. Now, they believe, it is time for the second coming. Director Chris Paine follows up his 2006 documentary Who Killed The Electric Car? with a film that takes us behind the scenes of the companies that are in the race for the resurgence of the electric car. It goes behind the closed doors of major car manufacturers Nissan, GM, and Tesla Motors, as well as independent car converters, following the development from concept through to working vehicle, the financial problems, successes and failures to see who will launch the first and best electric car that will win over the public. The film follow the electric car renaissance through the eyes of four industry pioneers. Bob Lutz is the larger than life General Motors Executive, a gruff, cigar-smoking maverick who seems to have stepped straight off the set of Mad Men. Elon Musk is the young dot-com billionaire and head of Tesla Motors who decides that Silicon Valley can teach Detroit a few lessons about car making. Carlos Ghosn is a former EV sceptic who astonished the car world in 2009 by announcing the launch of the Nissan LEAF: an affordable electric vehicle meant for the mass market. Backyard converter Greg "Gadget" Abbott is one of thousands of do-it-yourselfers, determined to start the EV revolution right now. Narrated by Tim Robbins and with appearances from Danny DeVito and Jon Favreau, and described by the New York Times as "A snapshot of a major industry shift on its way to a tipping point..." and ""a slick, enjoyable valentine to a retooling industry", Revenge of the Electric Car was a documentary award-winner at the Environmental Media Awards, USA last year. 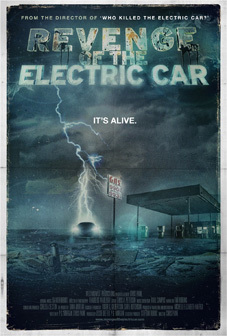 Revenge of the Electric Car will be released on UK DVD on 6th August 2012 by Dogwoof at the RRP of £14.99. Additional interviews and Theatrical Trailer.